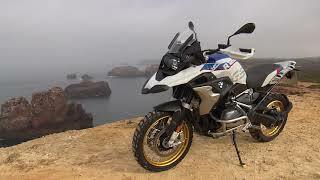 If you are longer on tour with your R1250GS you should be broadly equipped. Tools and spares you can easily achieve in our shop. For the optimal synchronization of carburetor and fuel injection system we offer you the Twinmax synchronizer machine. Due to the simple operation of the Twinmax you reach quickly the best possible engine performance. Furthermore, you got useful repair equipment like a tool box, Torx and Allen keys and many more. Solutions for the luggage storage are suitcases, topcases or bags in different sizes. Additional luggage can be fixed with expander or Tie-Down Straps. 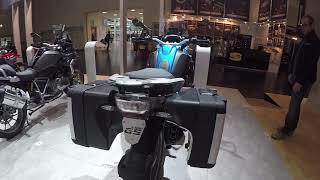 To increase the comfort at your BMW R1250GS we can change your one piece seat bench or front and rear seat according to your individual needs and wishes. Therefore you send the seat to us. A padding of the seat up to 25mm is impossible, but if there are only 30mm foam material on the plastic tray, a height reduction is not recommended. Our foot peg lowering or vario footrests with different offset opportunities for an optimal adaptation. Due to the handle bar risers or the mirror extensions you obtain an optimal ergonomics. You can find in our shop also a wide range of accessories for your BMW R1250GS, like different lifter and garage trolleys for the overwintering or to make repair works on the motorcycle easier. Our paint protection is a great guard against scratches. Furthermore, you have a great choice of different cleaning products, locks or other helpful accessories for the R1250GS. Safety is the essential thing while driving. If you want to be heard in road traffic you should use the Magnum Stebel Horn or the Nautilus Stebel Horn. Especially the Nautilus Horn impresses with a sound of 139 decibel. You will be also good seen with the right lighting. Turn signals or tail lights and the matching indicator bulbs for the BMW R1250GS you can buy in our shop. The protection of your R1250GS is given by our stable crash bars or crash protectors. 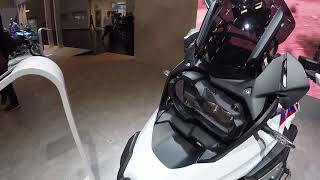 For an optical highlight ensures the various covers for the new R1250GS. For the fairing you have the choice between GRP or carbon products for the GS. We offer you mudguards, rear huggers, side covers and many more covering parts. Those motorcyclists, who are often on journey, appreciate the benefits of a navigation system. Here you can find navigation devices from Garmin or TomTom, as well as the appropriate mountings. For the perfect communication between other drivers we recommend the interphone devices from our shop.